Griefers! (Part 1): Griefing and The Griefer. Griefers by Wikipedia : “A griefer is a player who does things in a game to deliberately cause annoyance (“grief” in the sense of “giving someone grief”) for the griefer’s own enjoyment. Such a player is a particular nuisance in online gaming communities, since griefers often cannot be deterred by penalties related to in-game goals”. “Grifeing is the act of angering people in video games through the use of destruction, construction, or social engineering. Griefing has become a serious problem for server administrators who wish to foster building and protect average builder”. This is one of the things sometimes you can see in Second Life, Griefing in this case it was a spamming, usually it has bad words or it could be very offensive. It says “Grief Spam”, this is a spam attack to the public chat so everybody in the sim can get the message, some residents can get annoy of this but other just don’t care so much about this kind of griefing. As you can see this small and nice floating ship was doing the spamming and the grief spam, usually a greifer doesn’t have a common look in the metaverse they use the default outfit or even make a “wacky look”. Most of the griefers are recognized not how they look but for they weird and strange names. In the second part of this post, I will add other pics I took to another place with another griefer. I will put the nice speaking I had with this greifer. If one of this days you meet this kind of residents, just don’t deal with them. Ignore and teleport yourself to another place, it is a waste of time to deal with griefers, their only enjoy is to make you anger. 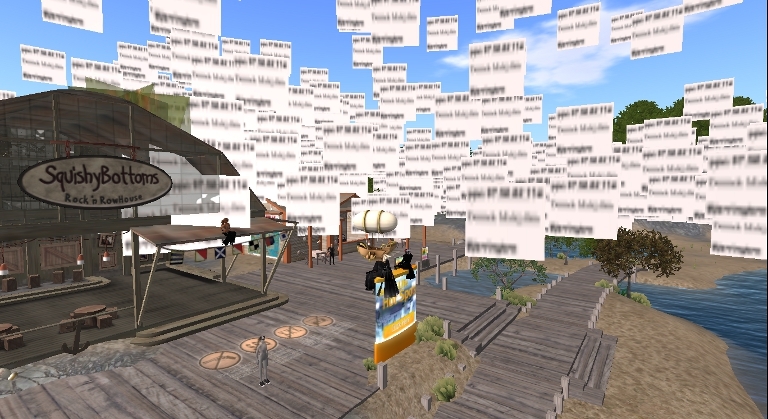 This entry was posted in Start and tagged Griefer in Games, Second Life Griefers and Griefers in Virtual Worlds on April 11, 2012 by Xpontaneus.